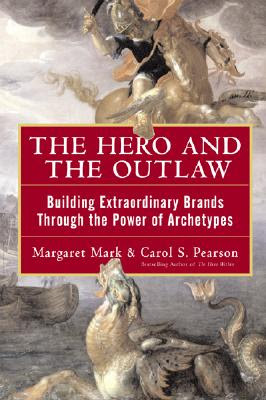 Just finished reading The Hero and the Outlaw: Building Extraordinary Brands Through the Power of Archetypes by Margaret Mark and Carol S. Pearson. I'm not the biggest fan of the book - the writing is a bit flowery and the authors seem like they're in their own little world, digging a bit too deep into their ideas and operating a bit outside of reality. Much of their writing, especially when attempting to sell their ideas, must be taken with a grain of salt. When approached as a guide to a theoretical way of thinking, however, the ideas presented in their book become become extremely useful in the world of advertising. The key idea behind archetypes is that there are universal themes, characters, and stories that have appeared repeatedly over the centuries, in every part of the world, resonating due to their special connection to the human consciousness. Heavy stuff, I know. But I took a lot of Greek and Near Eastern mythology in university and have seen enough of the similarities between the myths and legends of these two civilizations to recognize that there may be something to this idea. Character archetypes include everything from The Hero (think Luke Skywalker, Superman, and so on) to The Outlaw (think Robin Hood, Billy the Kid). My favourite example of a story archetype from the book is the story of The Foundling: one character, who feels very powerless and vulnerable, encounters a being even more vulnerable than himself, and becomes that being's protector. Eventually, the being must be let go in order to take care of itself, but by then the main character has gained the confidence to take care of himself, too. Think E.T., Free Willy, and Old Yeller. The reason these characters, stories, and themes keep reoccurring in stories (through myths passed down orally in ancient times, and movies in modern times) is that they seem to tap into our innermost feelings and emotions. 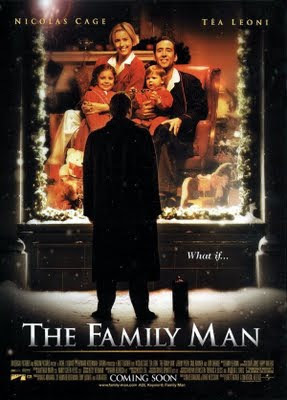 Each character is an expression of the innate human yearning to be that person or act in a certain way. For example, The Caregiver represents our inner need to care for and provide for our children and those who are vulnerable, The Magician represents the desire to change the things around us, and The Explorer represents the need to get away and find ourselves. Archetypal stories are typically those that teach us life lessons. In the Paradise Visited arc, the character gets a glimpse of paradise, or the way life should be, and applies those lessons when he returns to his normal life (think PleasantVille and The Family Man). The idea behind brand archetypes is to take the knowledge discussed above and apply it to everyday marketing in order to build brands and ads that resonate with consumers on a deeper level. When used inappropriately (usually when one gets into archetype theory too deeply or uses only this theory) brand archetypes can cause a lot of needless anguish for both the client and agency. They can be misunderstood and misused, and can leave everyone confused. When used in the right way, however, this can be an extremely powerful and inspirational way of thinking. The right way to think of brand archetypes is as a brand compass, a guide to a brand's personality, how it should act and speak, and the essence of what it provides to the consumer. It is a particulary inspirational way to express what a brand is about and what its purpose is, in ethereal terms. A brand's archetype should not dictate the execution in the ad, but should dictate how the brand acts in the ad. When they work, they work beautifully - not only do archetypes simplify how consumers view a brand and unify everything a brand says and does, they do so in a way that fosters a special connection with consumers due to their link to these timeless ideas and emotions. As you can see, it leans heavily into the emotive space. The ad is fun to watch and listen to, and makes me think positively towards the Blackberry brand. Hmmm... I get it: Blackberry is a passionate brand for passionate people, people who love to live their life, love to work, love the people around them, and love, well, love. Sure, I buy it. If the ads had stopped there, I would have been sold. But they didn't. The print ads (couldn't find one on the web, so I'll scan one when I find it) go much, much deeper. They are manifestos and poems on the topic of love, the emotion. They veer out of the realm of passion and into the territory of hippie-like positivity and unconditional love for all things. Essentially, they enter the realm of The Lover. And that's where this campaign loses it for me. The Lover archetype is about the yearning to belong, to attain intimacy with others and experience sensual pleasure. It's about being in a relationship with people, experiencing their company, being in the places one loves, and becoming more attractive. Although the Blackberry definitely helps us connect with people and maintain relationships, it does so in a way that takes us away from everything that The Lover is about. Blackberries don't help us experience intimacy - in fact, they get in the way. Think of the mother who checks her Blackberry at the dinner table, the husband who responds to email in bed, the flashing light that fights with our kids for our attention. Blackberries distract us from the people that we love, and thus never allow us to truly love those around us and our surroundings. Part of the reason for this is that the Blackberry brand will forever be tied to something very different than love - the corporate elite. CEOs, entrepreneurs, even the President. Blackberry is, at its heart, The Ruler. The Ruler desires to maintain control, to help a kingdom (or business) achieve prosperity by exerting leadership. Blackberries allow one to be in complete control of one's environment and organization - email, calendars, web, etc. It's the ultimate tool, the essential gadget, the utility belt. You can't operate without one. And as The Ruler, it carries with it elite badge value. When you've got one, it means you're important. You wear it on your belt for all to see. This is in part what makes it so alluring to have one. You feel powerful. You feel like a Ruler. I realized that this is the reason the "Love" campaign feels a little bit off - Blackberry is acting outside of its brand archetype. I want to end by touching on the idea of category archetypes, which is the archetype that is inherently tied to a product category. Categories are sometimes strongly tied to one archetype due to the way in which we are first exposed to them, their ultimate or original purpose for being, and so on. One example is beer, which is tied to The Jester - the category is about having a good time with one's friends and not judging each other. Although brands within a category will end up tapping into a variety of archetypes in order to be different from one another, they should always have a tie to the category archetype, lest they lose their sense of purpose. The ads play out like a magic wardrobe - whoever you want to be, George Brown can make it happen. And although the campaign strongly ties the brand to The Magician and the idea of transformation, it is still ultimately about education and wisdom. 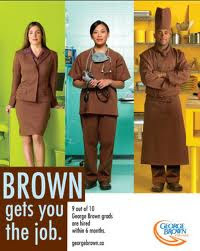 "George Brown gets you the job" clearly indicates that thought the brand may seem a bit whimsical, college is about attaining the knowlege that will get you into the career you want. It is ultimately The Sage. 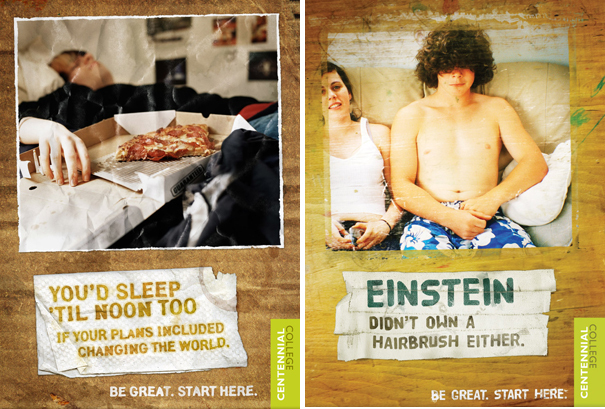 The ads seem to be trying to mitigate against the alienation that some kids may feel towards post-secondary education. By removing any elitist undertones, Centennial College is saying "Hey, this is a college for regular Joe's like you and me. Come as you are." I'm sold on the idea that The Regular Guy is a great way to position the college to its biggest audience, sure, but I feel like these ads steer too far away from what college is about. I see the name Einstein and the words "changing the world", but I don't see The Sage in these ads. The students that are portrayed are a bit too lazy, I bit too weird, and not someone who looks like they'll be changing the world anytime soon. They've forgotten that one of the key elements of The Sage is the idea of aspirations - students aspire to gain knowledge, they aspire to seek the truth, they aspire to become something better. That's why most post-secondary ads don't focus on who you are now - they focus on who you'll be once you're done. John, I really enjoyed your post. I'm a Lover and as you'd guess, I cannot stand BlackBerrys. There are people that come by my office poking on their BB and I think to myself, "What is it about those things that make people get so aggressive?" Its correlation with The Ruler and the self-importance it creates is spot-on. I think about archetypes for people, but I'd never considered them in terms of branding. I think iPhones are for Lovers :0) There's always something new and different it's very difficult to get bored. Have a Happy Thanksgiving, John! Hey! Thank you so much for sharing your thoughts. As for the proliferation of Archetypes in the modern world, I suggest giving "The Hero and the Outlaw," the book I mention at the beginning of this post, a read. Once you learn a bit more about how archetypes manifest themselves in our society, you will start to see them everywhere!